When I moved to western North Carolina from Colorado, I couldn’t believe how different it was. Compared to Colorado, I may as well have moved to a rainforest! It’s not really a rainforest where I live, but it’s moist and lush, and a lot of biodiversity exists because of the rain and warmth, especially in the summer. I moved to an area with about five acres and that first summer, I noticed lots of blooming plants that I usually didn't see in Colorado. Having an interest in biology, my inner scientist went to work and began investigating. I found that in and around my yard, I have so many useful “weeds” and plants growing. 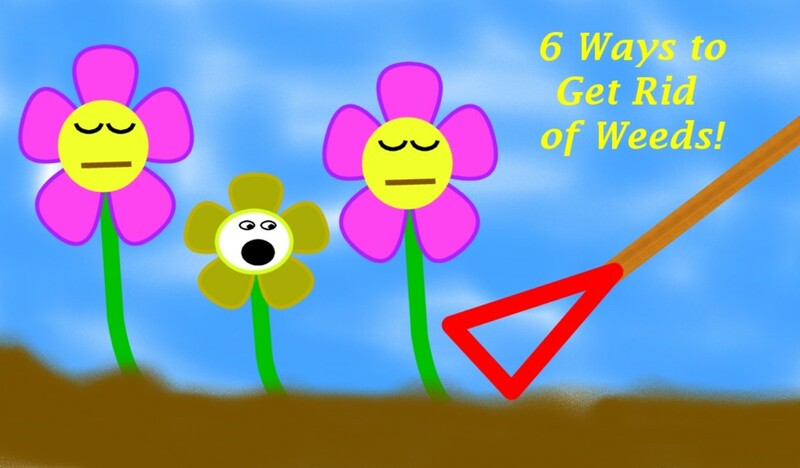 The following is a list of five weeds that are growing almost right under my feet! Though I do a lot of gardening, I never wanted to eradicate the wild plants growing in my yard. I always thought they were beautiful. Once I found out how beneficial they were, I began experimenting and making teas, cooking them in meals, and making fragrant oils, vinegars and even sachets from them. I will caution you, however. It’s extremely important to identify these plants with 100% certainty. Lots of look-alikes exist. Those look-alikes can be harmful or even fatal if you’re not careful. If you ever use them for medicinal purposes, it’s always best to check with a qualified professional (herbalist, doctor, homeopathic doctor) to be sure that you are not causing harm to your body. Everyone reacts differently to herbs (and weeds) and they can have drug interactions – use utmost caution. 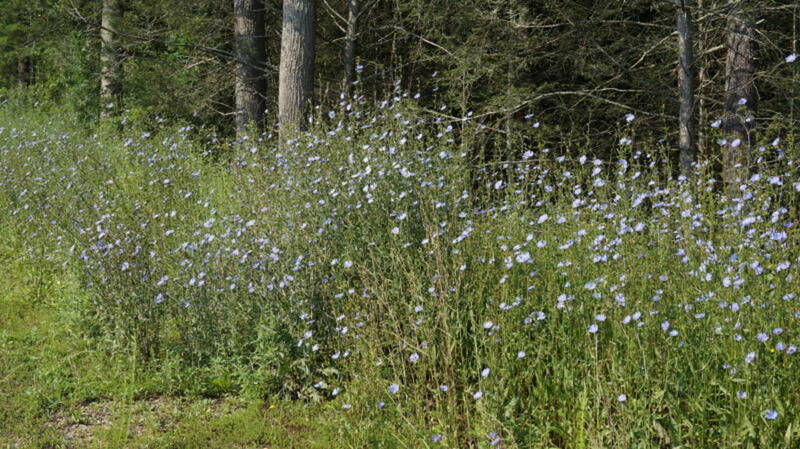 This weed caught my attention because it has showy little blue flowers on tall stalks in the spring and summer. It likes to grow in full sun and it decorates the roadsides with a beautiful display of color. It likes zones 3-7. It thrives in average or even poor soil. That’s good because I never really think the soil is that good near a highway. 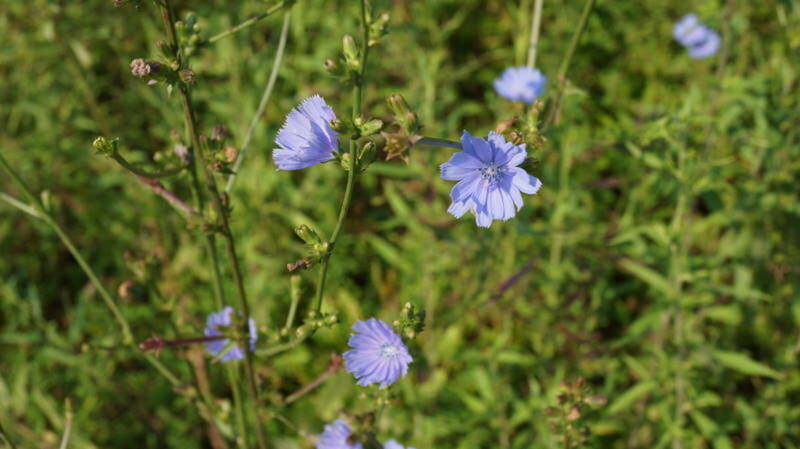 Chicory flowers begin to bloom in early spring and continue to do so into fall. The flowers don’t stay open all day; they open in the morning and close up. If you ever take cuttings of this plant, the flowers will still do this. If you are feeling adventurous, you can use young, fresh leaves from this plant in salads. They also cook like spinach. You can also take the roots, dry and then grind them into “coffee grounds.” In fact, the French used to add chicory to their coffees to allow for a more robust flavor. 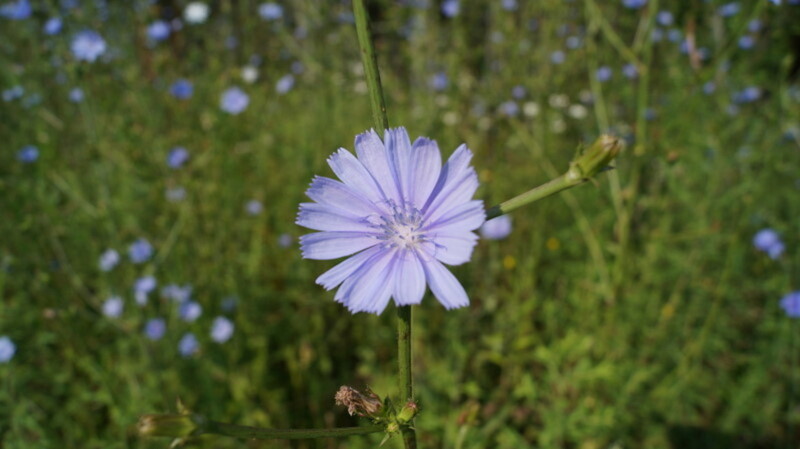 If you harvest chicory, it doesn’t dry or freeze very well, though. It’s best to use it fresh. I personally love the flowers so much that I’ll use the cut stems as decoration. A Field-full of Black Eyed Susans! You might be familiar with this plant. Indeed, black-eyed Susan is the state flower of Maryland. 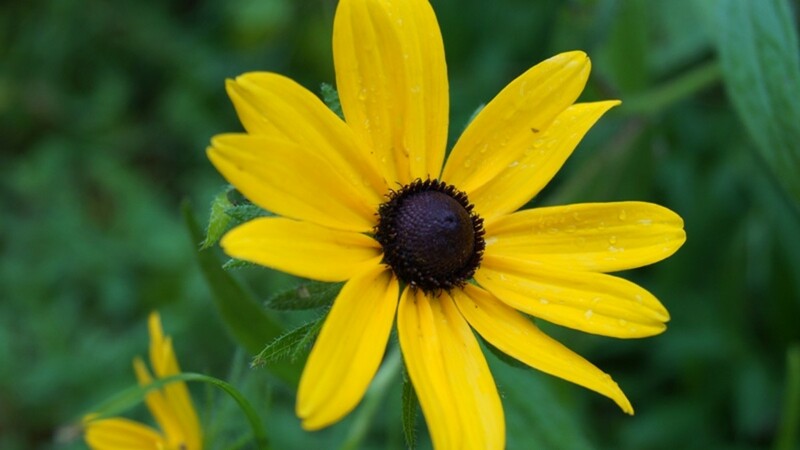 Sometimes this flower is called brown-eyed Susan. 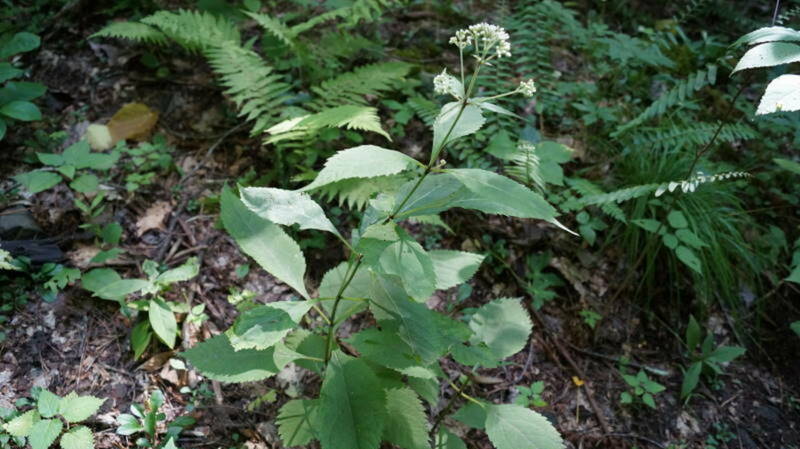 In the past, Native Americans useD the root of this plant to treat earaches, snakebites, intestinal worms, skin lesions, and even venereal disease. The flowers themselves make a 3” wide disc with a dark center. They can grow 2-3’ tall. 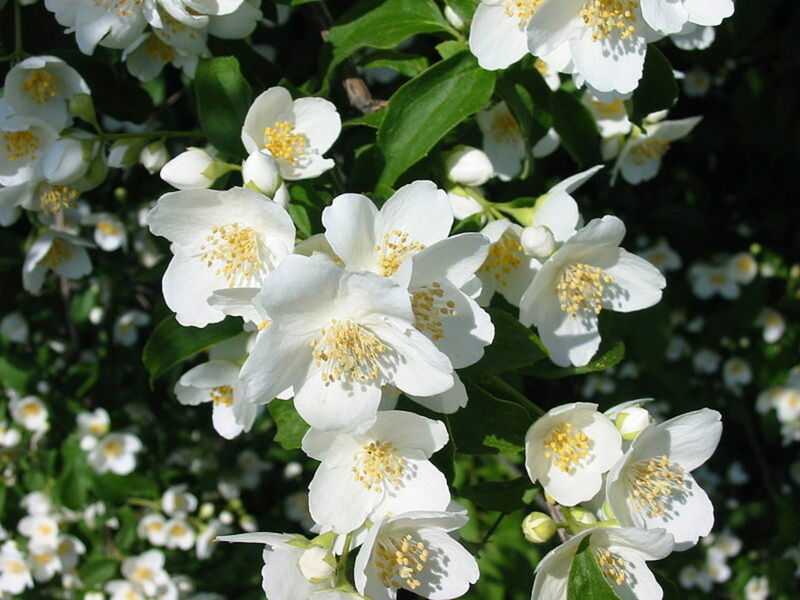 They like moist soil and will grow in partial shade to full sun. If they’re growing in the woods, they like to find a spot that gets a little bit of sun. Their brown disks turn into seeds, but they also can spread through rhizomes, which is why you’ll see them frequently growing in patches. They are a fun treat for butterflies and other similar types of insects. Get Those Hummingbirds to Visit Like Crazy! This is a fun plant! I had no idea what I had growing until I went to the farmer’s market last summer. A good friend of mine was selling a salve for poison ivy. I asked her about it because my husband is particularly sensitive to poison ivy. Luckily, I’m not. She said she made it from jewelweed and beeswax. She had a bunch of jewelweed that someone had brought her sitting in a bucket. When I saw it, my eyes grew wide. I have that stuff growing all over the place where I live. My house is surrounded on three sides by little streams. Since jewelweed loves to grow where it’s moist, it made sense that it followed the stream paths – I am also surrounded by jewelweed on all three sides. It has showy little fire-orange flowers that bloom from May all the way to the first frost. The flowers are only 1” long. It can grow 2-5’ tall. I’m only 5’4” tall, so it’s like a forest of jewelweed at my house starting in mid-summer! It grows in partial shade to full sun. The little flowers are a nectar haven for hummingbirds. They love them! Ruby-throated hummingbirds especially like them. If you mash up the leaves and stems, you can rub them onto skin exposed to poison ivy. It’s a great remedy to know about if you’re hiking and you think you touched poison ivy. Jewelweed often grows alongside it; how neat that the cure grows alongside the cause of the problem. Silverleaf is another name for jewelweed. When the leaves have moisture on them, a little film on the leaf makes it look silver. You can cook young leaves up just like spinach. I haven’t tried them, but I hear they’re delicious! When the seed pods are ready, they’re like other impatiens plants: if you touch them, they’ll explode. I’ve had lots of fun popping them open and watching the seeds go flying. Native Americans had also discovered medicinal uses for this plant. 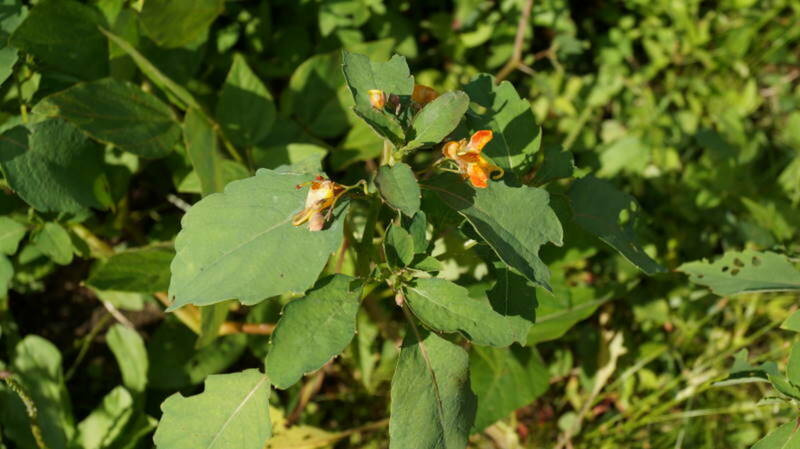 They knew that a poultice of jewelweed would help alleviate a number of skin problems, including burns, rashes, sores, bites and even eczema. Nettle Seeds - Just Don't Get Stung! 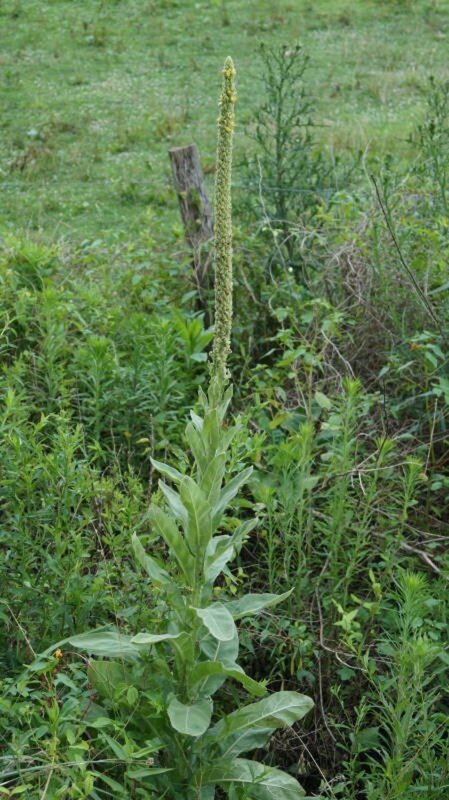 I first encountered this plant on hiking trails when I moved to North Carolina. I later discovered it growing on the mountain behind my house. First impressions aren’t always right. 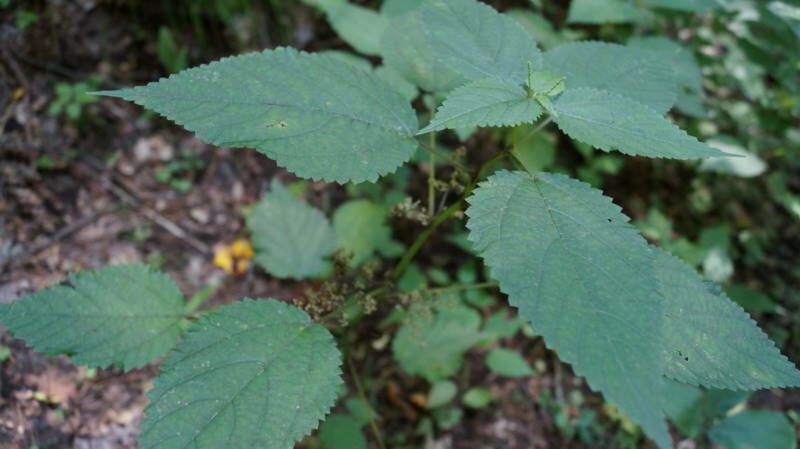 I detested nettle because touching it made my skin swell like I had a cat scratch and then it stung for hours. I had no idea of the powers of nettle. My impression of it has completely changed. This plant has lots of vitamin C, calcium, magnesium, manganese, iron, potassium, zinc and other nutrients and minerals. People have even used the fibers from the plant to make different types of cloth. It’s a perennial and has pointy, jagged leaves. The plant itself can grow anywhere from 2’-6’ high and has flowers from summer to fall. The greenish flowers you see are the males; the females tend to grow more closely together. Tiny stinging hairs grow all over the plant, so be careful as you harvest it. If you are familiar with dock leaves, they will help the stinging from nettle. You need to wear gloves that will protect your hands and arms when dealing with nettle. It’s best to cut the plant above its root and use before it starts blooming. If you get it after it flowers, that’s fine, but it won’t be quite as good. You can use all parts of the plant, but you need to cook or boil it. You don’t want to sting yourself! Cook the leaves like spinach. You can also make a tea from it – use boiling water and steep for 20 minutes. The benefits of nettle are astounding. You can use it as a tonic for the hair and scalp. It does wonders for the genitourinary system, helps your metabolism, helps alleviate symptoms of PMS and menopause, and helps strengthen the liver. It’s also known to help increase your energy. 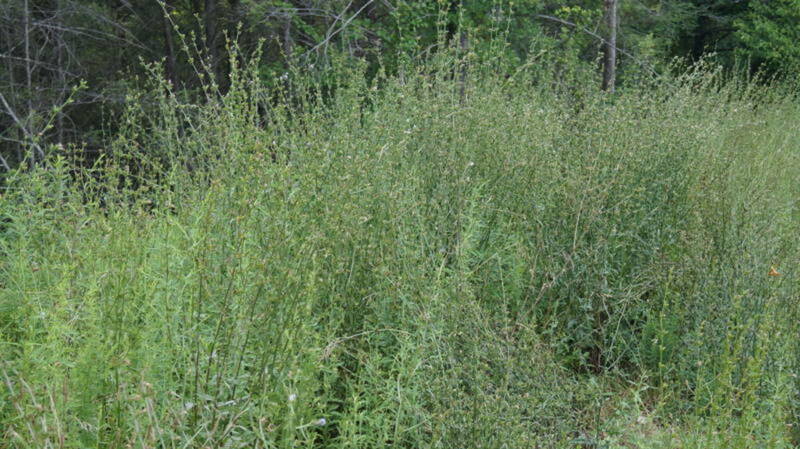 Have you ever used any of these "weeds" before? No, but I want to try! I’ve heard that this plant came over with the Europeans and wherever they went, this plant went, too. It’s also a fun plant, though. It grows in Zones 3-9, in full sun. It grows quite tall – up to 6’! It can really spread out – you’ll sometimes see it 2’ across. Its hallmark characteristic is its big stalk that shoots up. It has yellow flowers that are quite fragrant. At one time, it was called the torch plant because people would dry it, dip it into slow-burning oil, light it and use it as a torch. 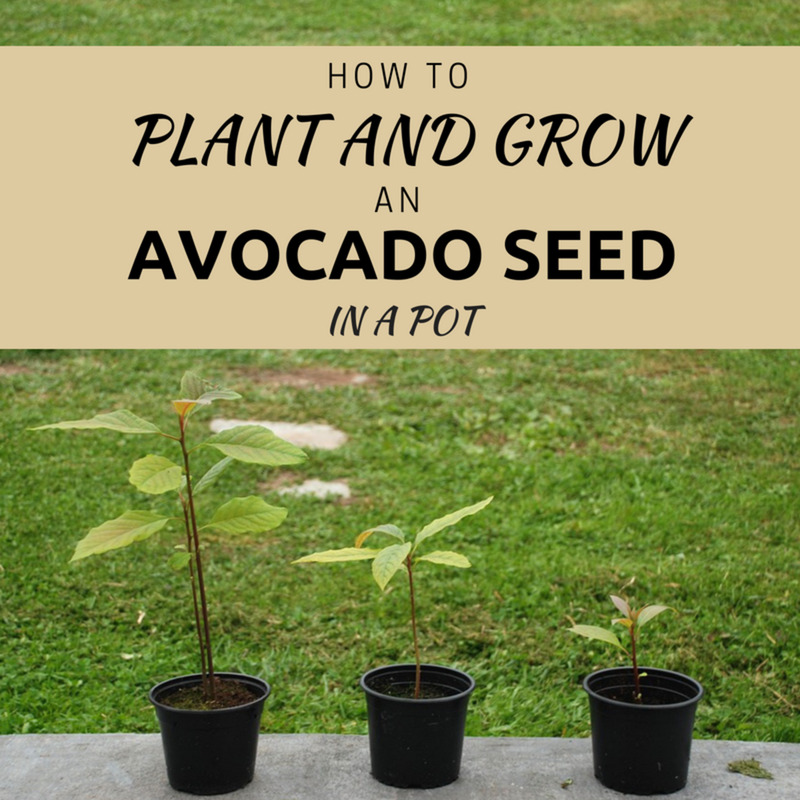 You can use all parts of the plant except the seeds – they are toxic. The leaves, however, are great for respiratory ailments, bronchitis, and asthma sufferers. Make a tea from the leaves and then breathe in the vapors. After the tea cools, drink it. If you take the flowers and put them into oil with equal parts of garlic you can make an infused oil that will treat ear infections. Add just enough oil to cover the mullein flowers and garlic in a pan, then warm them over low heat for about 20 minutes. Remove from heat, let cool, strain and store in refrigerator. For ear infections, heat the oil to body temperature by leaving it on the counter or heat very briefly in a pan. Using a medicine dropper, deposit 3-4 drops into affected ear. Repeat frequently until the ear feels better. The oil can also treat cuts and scrapes. Indeed, these five weeds have special value to us as humans. They are beautiful, too! Which Weed/Flower Do You Like Best? Audrey - thank you! I intend to explore these weeds more in the coming seasons for sure! They're so beautiful and fun! Cheers! Someone made me some nettle soup once that was just delicious! This is such a great hub Cyndi! I have always been curious about Chicory! Oscarlites - that's what happened to me. :) I moved to a different part of the country and didn't know anything, so little by little I started investigating. It's fun, hehe. I'm always interested in herbs and their uses.. thanks for the information and pictures. I guess I better start seeing what native herbs Alabama has. After living in Alaska so long, Now back where i was born, I am learning a new culture it seems. thanks! A very interesting and a unique topic. 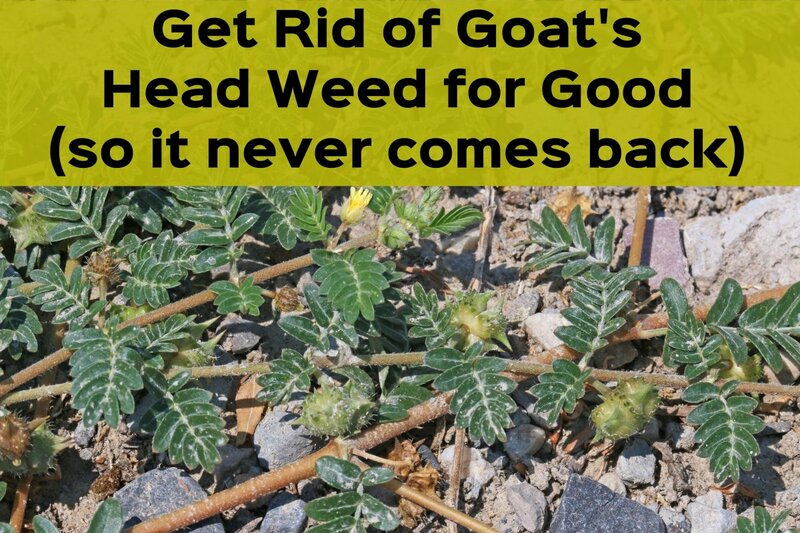 Who would have thought a weed can be useful!! Voted up and shared across. Congratulations on your award. RedElf - haha, that sounds like a horse with sense. :) It also sounds like she had a special spot for grampa. :) Thank you for stopping by! One of my grandfather's horses was crazy for mullein - she would come to a dead stop and much out until she's had her fill. Not even straying calves or a good poke in the ribs could persuade her to move along once she started eating. She would move along for my grampa - a cavalry man in WWI - but she knew she could ignore us kids with impunity. We would just have to wait for her to finish. Christine - haha, I like both of your suggestions. I'll tell my hubby he might have found a niche! LOL. But, I have often dug up weeds I like growing somewhere around where I live and transplanted them to the yard. It's really weedy but so colorful and I'm learning about all the different sorts of weeds and they're so much fun to experiment with - I'm really careful to positively identify them, but yes, I have so much fun exploring "weeds." Hehe. 6 years ago from My office. The Totem is awesome. You should get hubby to do more and sell them online! 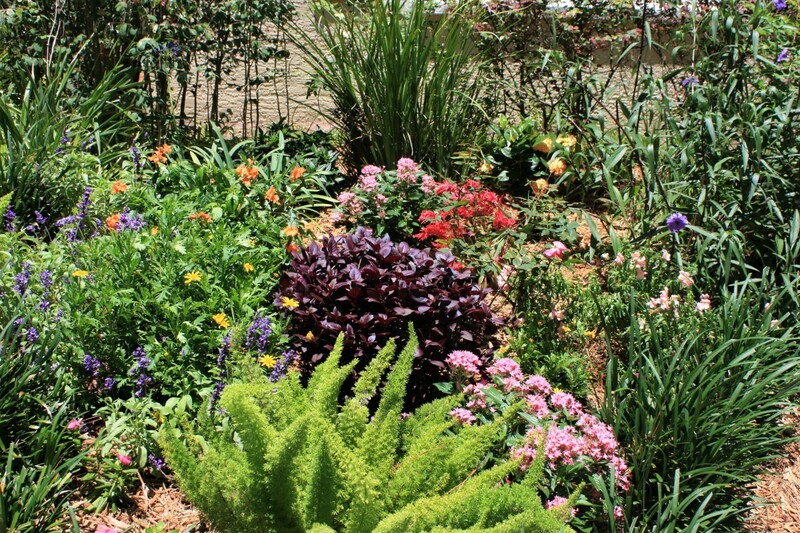 I tend to go for drought resistant flowers in my yard because I am too busy (and lazy) to water daily. Every summer I see lovely flowers growing wild on the side of the rode and tell myself I should carry around a shovel and a bucket to transplant them in my yard. :) I figure if they grow on the side of the rode with little maintenance then they should be good a good fit for me. I love your backyard and garden! So wild and green! I have a strong aversion to weeding, especially when the weeds tend to attract the pests away from my more 'valued' plants. Occasionally I raided the dandelions and baby nettles for salads and herbal teas. Now, with only a balcony garden, I get few helpful weeds, so I make sure to have at least one mixed pot of the less common herbs and some wildflowers. Yes, jewelweed often does grow right next to poison ivy - interesting that the "cure" grows next to the culprit, huh? Hehe. idigwebsites - thank you so much! I had some fun writing this hub. It's fun discovering all these weeds. I appreciate your feedback. Cheers! This is one of the best discovery I have so far, thanks to your wonderful hub. It is really really a good hub. Another food variety for my list. What? No lemon balm?? Although the "weed" I came to find wasn't represented...you have a wonderful selection with beautiful pictures (do I sense another HOTD coming? I bet I do! Your hubs are always so incredibly informative! You got talent! Very useful and interesting. Thanks for the information about the benefits that we can get from weeds. Voted up and more. The area we live in is rife with all kinds of great "weeds." I wrote a hub with a different perspective on weeds. You might get a kick out of it! Voted up, useful and interesting. I'll be reading some of your other work too! 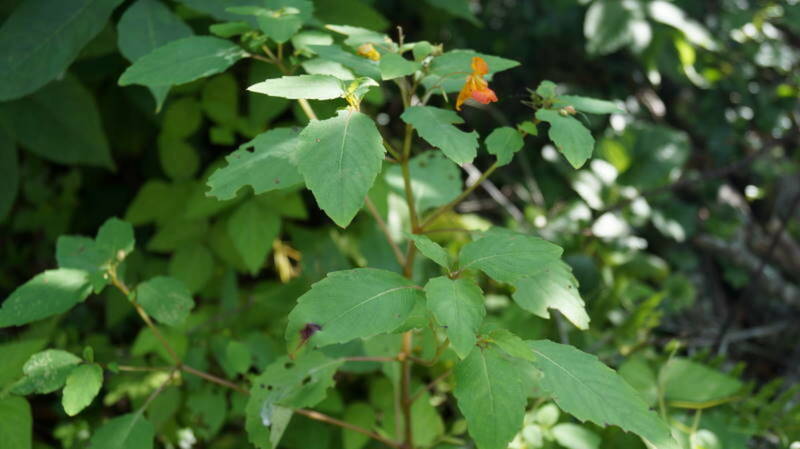 Jewelweed often grows adjacent poison ivy so be careful! B. Leekley - hey there! Great to see you! I hope lots of edible and beautiful wildflowers grow in your area. :) Thank you for the votes and shares. Cheers! Thanks for the useful information, cclitgirl. 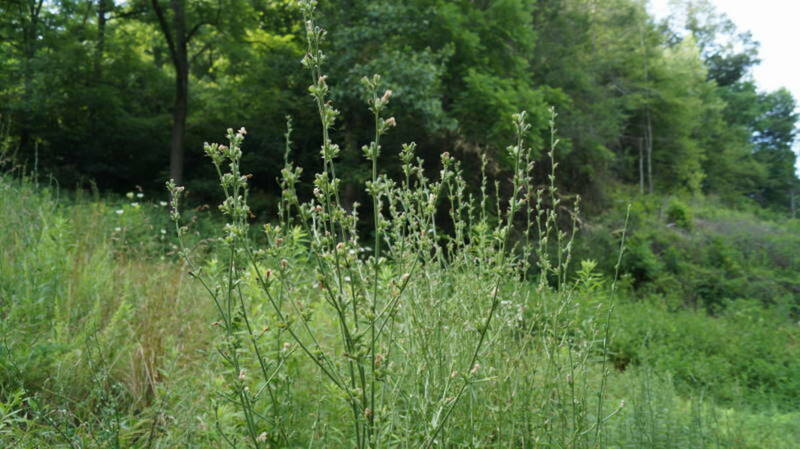 I'll keep an eye out for those edible wildflowers here in Kalamazoo, Michigan. Up, Useful, Interesting, and shared. kelleyward - Haha, that's really awesome! I love it when we can discover things right in our own yards. I am still making discoveries - there are so many different varieties of plants that as soon as I discover one, I find another that I don't know about. Haha. Thank you for your comments ~ have a wonderful day! I just visited North Carolina for the first time, and I wish I had read this hub prior to my visit. This information inspires me to look up the weed in my hometown. Thanks! Grandmapearl - hehe, you know, I went out searching for yarrow, nettles, red clover and raspberry leaf yesterday in the woods. I'm thrilled to be drying some now. I got chiggers around my ankles, but nothing a little tea tree oil won't fix. :D That is very cool about the birds! I love birds - they are such spiritually uplifting creatures! Thanks so much for stopping by! cclitgirl, kindred spirits is right! You know many years ago I watched the bees and butterflies swarm all over my nettles patch when it was in flower. Those flowers seemed tiny and insignificant to me, but they were certainly attracting a lot of attention. So I did as you have and investigated all the cool stuff that nettles have to offer. Its seeds are also beneficial to birds. They probe for them in the soil and pull them off the plant as well, all because of the minerals, specifically calcium. The nettle not only helps to keep them healthy during the cold winter months, but it builds up their calcium levels so they can produce viable eggs and happy baby birds! All this right there in my little weed patch--who knew! That's one of the reasons I dedicate a whole garden box to them. Definitely keep the good stuff coming! Grandmapearl - I'm starting to think we're kindred spirits! Nettles are definitely an herb that grow in abundance around where I live. I've focused so much on red clover and raspberry leaf, I need to explore nettles even more. I was just reading about them last night (again) and learned something new: they have just about every vitamin and mineral that humans need packed into just ONE plant. I can't believe humanity doesn't have this selling at every store and in every tea! But then again, I kind of like the idea that this stuff remains mysterious and isn't heavily cultivated. :D Thanks for stopping by at another hub of mine. You know you're inspiring me to keep going with this, right? Hehe. You have listed and shown some of my very favorites. 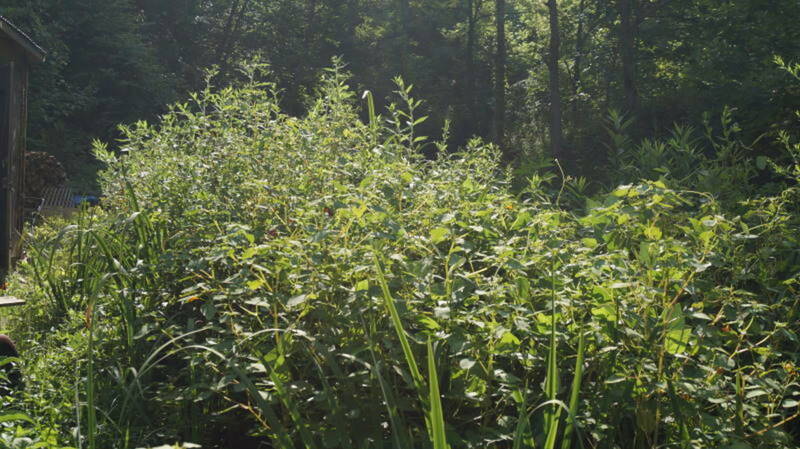 My grandfather told me when I was very little that if you have jewelweed, you have poison ivy nearby. It seems that this may be the case for a lot of 'natural cures'. My hummers are in the jewelweed patch hundreds of times a day! Those nettles are great plants. I have a whole 6' x 12' planter box full of them. Mostly I share them with the insects and birds! I like the way that you work with Nature and not against it. Very impressive, informative and well-written. Voted Up, Shared and Pinned! rbm - yeah, only once did I ever buy "Roundup" and boy, that was one time too many. I only actually used the stuff once on two weeds in my garden - a long time ago. The alarming color and awful smell told me it couldn't be good and that it was probably better to just pick the weed if I didn't want it there. I remember that moment so poignantly. Since then, I've worked with the weeds in the garden and just pull them if they're competing with my veggies. I have a great garden, too, and beautiful wild-flowered-weeds that often come in handy. :) Thanks for stopping by! It's amazing to me how many wonderful and useful plants we call "weeds". A lot of them are full of nutrients and healing properties, and we just ignore them, or worse try to eradicate them. Great hub, voted up! furniturez - Hi there! Thank you for stopping by! Well, let's see. I didn't know a thing only a few years ago. I went to the library and started in on the whole thing by checking out books on herbs. There are so many that just grow wild. From there, you can branch out and check out wildflower books. :) I appreciate your feedback. Cheers! As someone who's never eaten a flower or weeds, can somebody recommend where to start?? I guess which one tastes the best? Or is the healthiest? VC - aw, thank you so much for stopping by! I appreciate the kudos and I'm thrilled that you found this hub exciting - I do love finding out about things that you can "pick and eat" while on a walk. Hehehe. Thanks again!! Hubhugs. First I want to congratulate you on the 2012 Hubbie Award. And now I want to tell you how much I like this hub. Learning all about edible weeds is very exciting. Can't wait to share this information you have so nicely put together. Thanks so much! Dirt Farmer - I knew it! :D It's beautiful! I can see why you have it as your avatar. The Dirt Farmer - very cool! Is that a zinnia I see in your avatar? Indeed, it wasn't until I started gardening all the time did I realize that I wanted to identify the plants growing right in my back yard! Thanks so much for stopping by! Cheers! 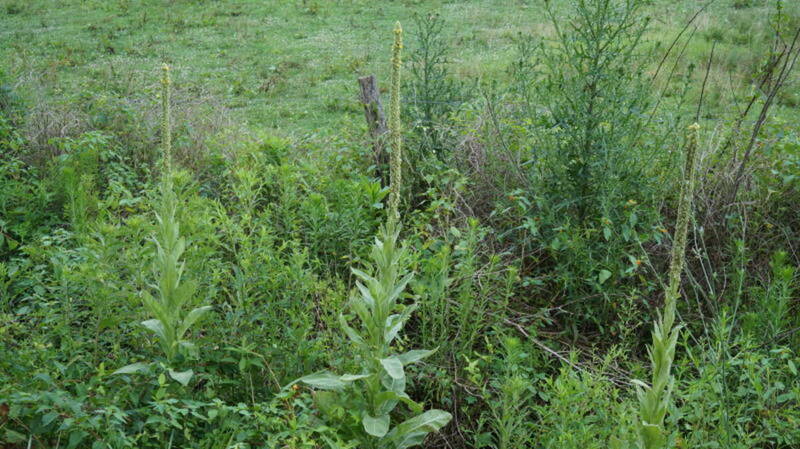 We have torch plants in the pastures on our farm. Some of them are enormous, and I've noticed that they tend to grow in rows. They're the oddest plants. Good to know they're useful! Tom Rubenoff - when I was younger, I was always intrigued by my natural surroundings, but it wasn't until I got older that I've really become fascinated with wildflowers and herbs. Thank you for your feedback and kind words. Cheers! Deborah - thank you. *blush* That's great you're from Charlotte...it's so beautiful here. :) I love the lush greenness and all the biodiversity here. So many things just grow right in my yard! Hehe. Thanks for stopping by! Hubhugs! I have always been fascinated by wildflowers and herb lore. This article is a real treat. Thank you! You moved to my home state. I was born right beside of Charlotte. Your knowledge in this area just continues to amaze me! I have learned so much from these hubs and like Teresa, am seeing these plants in a new light. Thank you for sharing your knowledge with us! aviannovice - indeed there are!! But, I'm sure you already knew some of these what with your amazing lake experiences. :D Thanks for comin' by! Hubhugs! K9 - hehe, I wondered if anyone would notice that. 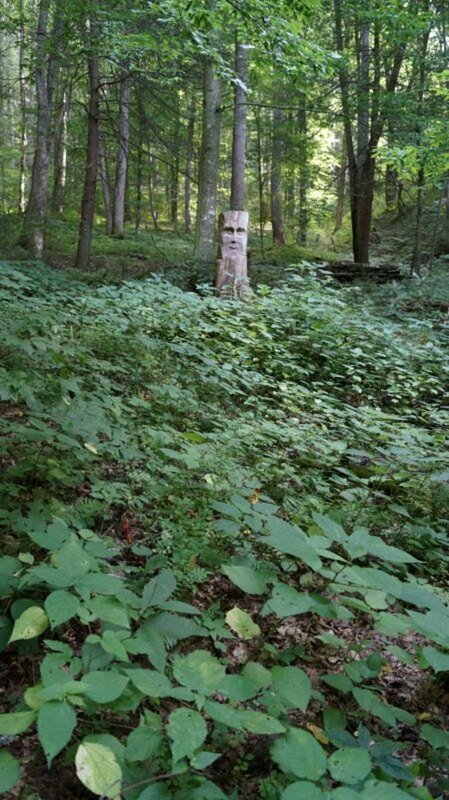 :D My hubby likes carving and making crafts like that, and since that big ol' totem stands in the middle of our backyard, I had to include it. Thanks so much for stopping by. Hubhugs to you! There are lots of good and wonderful wild plants out there, I see. Fantastic information on beautifully edible weeds in our yards! I learned a ton of stuff by reading this article CC! I particularly enjoyed your husbands totem carving! How very cool! A "Pinteresting" experience, thanks! Unknown Spy - thanks for stopping by! These are beautiful, aren't they? Cheers! wow..never seen those weeds before. i agree, they're beautiful. Alocsin - indeed, some peoples' yards will have these and some won't. 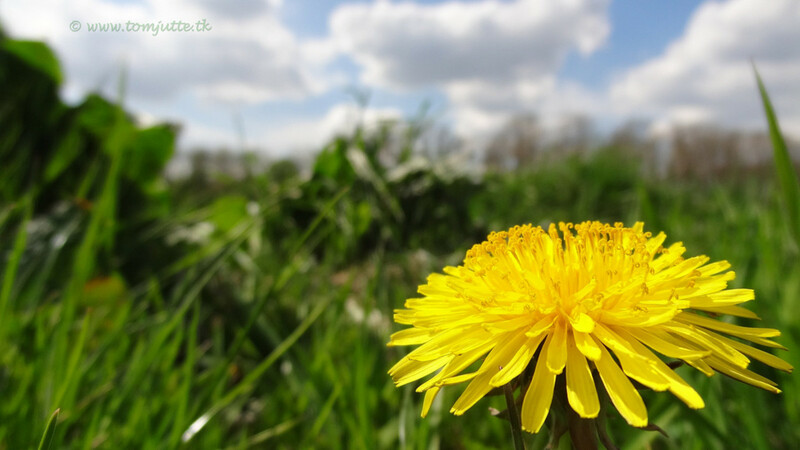 Dandelions have LOTS of uses and ingredients derived from dandelions are in 50% of our pharmaceuticals. But, I'll bet California has lots of chicory, mullein, and black eyed Susans on the hillsides. Not sure though. Let me know if you find them. :) Cheers! Teaches - hi there! Chicory is such a lovely flower - I mostly like to display the flowers in a pretty vase. Hehe. Thanks for stopping by as always - you brighten my days. :) Cheers! I don't think my yard has any of these weeks. Will need to look for them the next time I'm out. 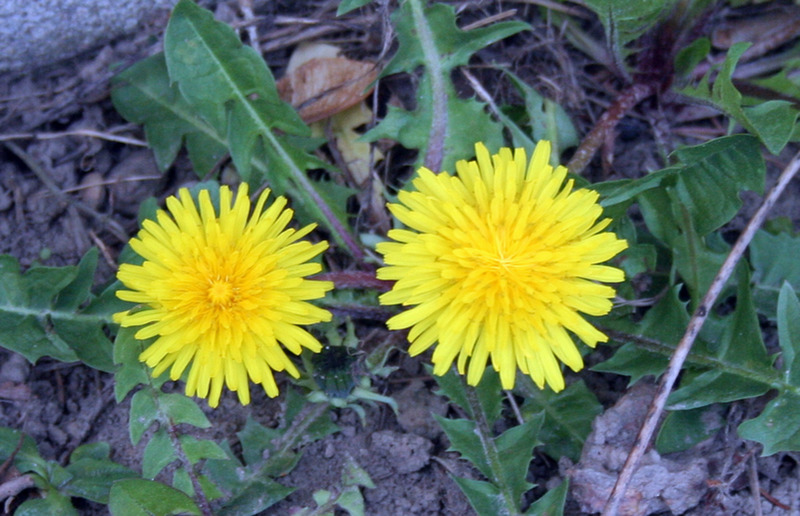 Mostly we have dandelions, which also has its own uses. Voting this Up and Useful. The chicory is a surprise to me. I find it a bitter taste, especially in coffee but the flower itself is so pretty. Great information and so interesting to read. tirelesstraveler - hehe, yeah, those stinging nettles. My legs are often covered with welts after a bike ride, too. Indeed, for such a nutritious plant, it doesn't give up its secrets that easily. :D I'm glad there were no ill effects from the camping trip. Hubhugs! Aw, Ardie. You always have such wonderful things to say. Thanks for comin' by! ;) Hubhugs. Teresa - that's great! I forget what zone Ontario is, but either those "weeds" are hardier than I thought, or you're at least in Zone 3. hehe. They definitely have some real benefits. :) Hubhugs! livingpah2004 - thank you for the votes and feedback. :) Cheers! tillsontitan - I know, right? Nettle is so unassuming. When I first learned about it, I was astounded. Thank you for your feedback on the photos, too. I appreciate your thoughts. Have a wonderful day! Hubhugs! Amazing CC, I see most of these plants at home here in Ontario. I did not know of any of their beneficial quality. I will look at all of them in a new light as I watch them grow on our property. What a surprise to learn about the uses of nettle of all things! This hub taught me so much in such a little space. You gave great information on each of these 'weeds' and your photos are beautiful and definitely helpful in identifying these 'weeds'. Voted up, useful, beautiful, and interesting! brenda12lynette - edible plants are so much fun. hehe. I've become a bit of an addict as I study them. :D Thanks for stopping by! Hubhugs. This is such useful information! I've always wanted to learn more about edible plants. Voted up and useful!